It was the middle of the 20th Century and Alfred Hitchcock's last major film had been Notorious (1946). Four years and four films later, he was in a slump. Though The Paradine Case, Rope, Under Capricorn and Stage Fright were all interesting attempts, each one had its problems and each had bombed. For his next project, Hitchcock looked to the first novel of young Patricia Highsmith. Intrigued by its clever "criss-cross" murder plot, he bought the rights to Strangers on a Train. Raymond Chandler was tapped to tackle the screenplay, though Czenzi Ormonde, a protege of Ben Hecht, rewrote most of it. 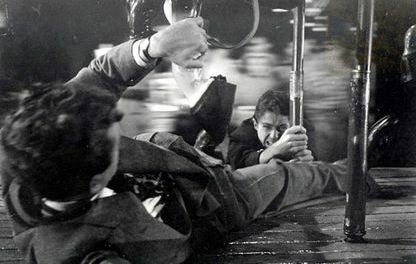 Cinematographer Robert Burks collaborated with Hitchcock for the first time and earned an Oscar nomination for his efforts. He was nominated again for Rear Window and won for To Catch a Thief. Dimiti Tiomkin, who had last worked with the director on Shadow of a Doubt, composed the film's nimble score. Hitchcock produced and directed for Warner Brothers. 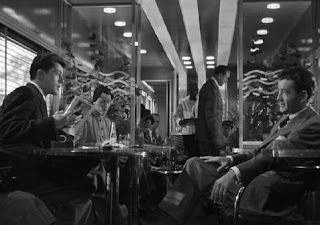 A thriller of mature scope and depth, Strangers on a Train (1951) is also considered one of Hitchcock's most accessible films; its overwhelming success revived the director's reputation at a crucial point. It also signaled the beginning of his final great filmmaking period. There are spectacular visual set pieces, among them...1) Bruno stalks Miriam at a fairgrounds and, in a stunning shot, strangles her on a secluded island, 2) Guy makes a stealthy visit to Bruno's darkened home where a large growling dog adds even more suspense, 3) An intense tennis match is cross cut with scenes of Bruno's harrowing journey to plant evidence, 4) a carousel disaster comes to a breathtaking climax. Prominent historical sites appear; Washington, D.C., landmarks are woven into the scenario with the Jefferson Memorial in a stark cameo. There is an "innocent man accused" theme and a powerful doppelganger motif. Though there are no marquee names, the cast is solid. Farley Granger fleshes out handsome, guileless and beleaguered tennis star Guy Haines; Laura Elliott (Kasey Rogers) is delicious as his estranged wife, Miriam; Marion Lorne stands out as Bruno's discombobulated mother. Leo G. Carroll is credibly senatorial as a U.S. 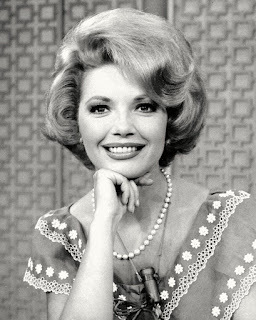 Senator and Patricia Hitchcock gives one of her best performances as his quirky younger daughter. Alfred Hitchcock once told Francoise Truffaut, "...the more successful the villain, the more successful the picture. That's a cardinal rule..."
The bold, unforgettable performance of Robert Walker as psychopathic Bruno Anthony is proof positive of that rule. Remarkably, Walker had mostly been cast as male ingenues up to then. Like Joseph Cotten's Uncle Charley in Shadow of a Doubt, Walker's Bruno is a glib, self-possessed charmer - who is also a remorseless killer. Walker is riveting onscreen. His Bruno is confident, slick, erratic...and very, very creepy. His smooth veneer barely masks a simmering rage. With a voice that ranges from sensual as velvet to cold and hollow as tin, his eyes glitter, glare, caress. From the moment Bruno is first seen in the club car insinuating himself into Guy's life, to his final seconds of life, when he mercilessly implicates Guy with his dying breath, Walker dominates and energizes the film. Pat Hitchcock once observed that for all her father's genius, it was Walker's daring performance that 'made' the picture. Walker died tragically at age 32 less than two months after the film was released. He had appeared in more than 30 films in his career, but it was only Strangers on a Train that allowed him to unleash the devastating range of his talent. Farley Granger later reflected, "he was great in the film; his potential was limitless, his career was just beginning to take wing." 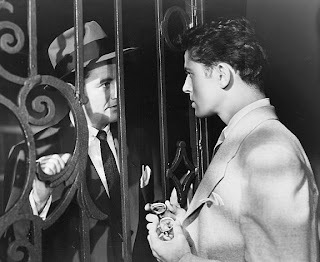 Robert Walker's life had been short and often troubled, and his early death sent shock waves through Hollywood. In time, though, it became clear that he had a bit of good fortune after all; his greatest role, his single virtuoso performance, was preserved within one of Alfred Hitchcock's finest films. British film critic and historian David Thomson noted in a piece on Strangers in 1999, Hitchcock's centennial year, that Walker's was "...a landmark performance. You see it now and you feel the vibrancy of the modernity...he had had that one chance..."
This Saturday, April 17, TCM features Strangers on a Train on this week's edition of The Essentials. Robert Osborne and Alec Baldwin will discuss the film before and after it airs. 8:00 pm Eastern, 5:00 pm Pacific. Eve, Wow! excellent post. What a landmark performance by Robert Walker. This is light years from his good work In Since You Went Away, The Clock Bataan, 30 Seconds over Tokyo, and Sea Of grass. I'm looking forward to watching this again and making a DVD copy on Saturday. Wonderful post on a great Hitchcock film. When we studied Hitchcock in film class we watched this along with Psycho and Marnie. For me, Strangers was the one that stood out the most. I remember being transfixed by the tennis match and Bruno's planting of evidence at the same time. Again, thanks for your insightful review of this Hitchcock masterpiece. 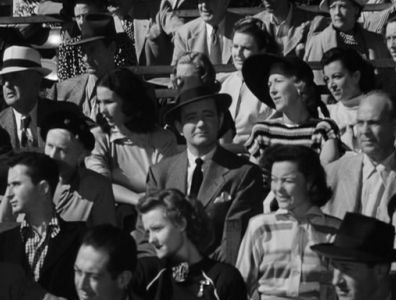 Eve, this is fabulous post on a Hitchcock classic--it's both educational (e.g., I didn't know Walker died so soon after the film) and perceptive (e.g., the doppelganger theme, the similarities between Bruno and Uncle Charley). As for the film itself, it slipped a few notches in my Hitchcock movie rankings after a recent viewing. Frankly, this surprised me--as STRANGERS was firmly entrenched in my Hitchcock Top Ten for decades. But it didn't seem as gripping as it once did. To be sure, there were several excellent sequences, to include the marvelously disturbing murder scene on the island that you described. I know I'm be in the minority here, but I think the central performances were merely adequate. Walker's villain seemed a tad over-the-top, especially compared to the more subtle villains in SHADOW OF A DOUBT, NOTORIOUS, and other Hitch classics. In contrast, I think Farley Granger underplayed his role, coming across as a vanilla hero. It's interesting how the screenplay tries to justify his relationship with Anne by emphasizing how awful his wife is (e.g., she's carrying another man's baby, goes on a date with two guys...and then flirts with a third!). 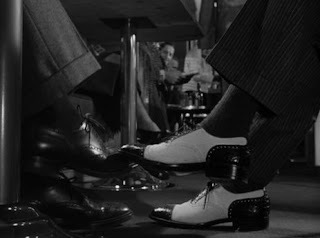 I think the first third of STRANGERS works best: the opening shoes montage (reminded me of the opening scene of MARNIE where we follow her legs); the conversation on the train; the "following" sequence at the carnival (reminded me of "following" scenes in SHADOW and VERTIGO); and the murder. It was fun to see Aunt Clara from "Bewitched" as Bruno's mother and STRANGERS would make an intriguing double-feature with another Patricia Highsmith adaptation, PURPLE NOON (the first version of THE TALENTED MR. RIPLEY, which also has a doppelganger theme). Needless to say, I'm on the same page and Paul and Kim...and disagree with Rick's take on Farley Granger and Robert Walker's performances, the film's effectiveness from start to finish or it's stature among Hitchcock's films...Walker nailed it and Granger is an excellent foil. 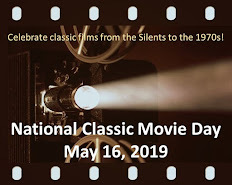 The only weakness in the film is Ruth Roman's performance, but it's relatively insignificant in comparison with the film's many, many strengths. STRANGERS is somewhere in my top five Hitchcock's along with VERTIGO, NOTORIOUS, SHADOW OF A DOUBT and a tie between PSYCHO and REAR WINDOW. I was happy to see that a major critics or two also list it "top five" as well. I'd personally like to see STRANGERS double-featured with SHADOW OF A DOUBT, they've always seemed "related" in many ways. I'd love to have seen what Hitchcock might've done with RIPLEY. By the way...this blog "self-posted" in the middle of the night, I wasn't planning to publish it till tomorrow and it wasn't quite done...so you may notice a bit of editing even though it's up. TheLadyEve, Awesome review!! I love this film. I have Strangers on a Train, in my DVD collection. It is not my favorite scene. But for some reason stands out.. the comic scene at the tennis courts where the audience moves thier heads back and forth in unison following the ball except for Bruno who stares at the tennis player. Eve, you wrote an excellent and informative tribute to "Strangers on a Train." The pictures you posted were perfectly selected, too. 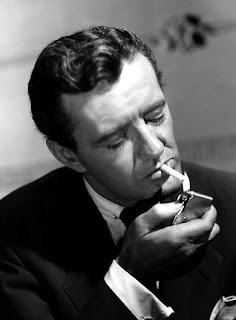 I did not know that Robert Walker had died at such a young age. He truly did have his signature performance here. Like Dawn, I was mesmerized by the scene at the tennis game where everyone else is watching the game but the killer. 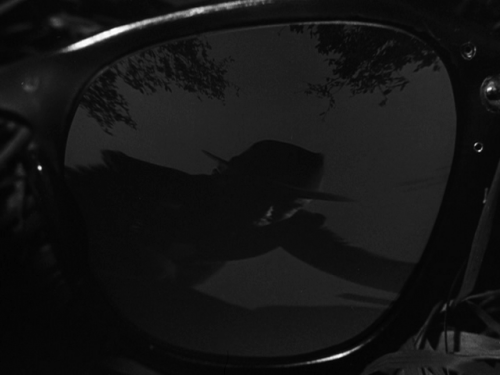 The scene where we view the murder in the lens of Miriam's fallen glasses is classic Hitchcock. I love the doppelganger themes of shoes, tracks, train rides, women with glasses, etc. For me, I can't be sure if I am not as fond of the performance given by Farley Granger or if I just don't care for his character. Though Miriam is not the spouse anyone would wish to have, Guy is also guilty of adultery with Anne. He allows himself to be bullied by Bruno (and we learn he is bullied by Miriam, too) and stupidly leaves his lighter behind after a bizarre conversation about exchanging murders with a disturbing man he has just met. Guy destroys all of the evidence that Bruno sends him, too. I think that if Bruno seems a bit over the top, Rick, it is because Guy is so much weaker. The performances that stand out to me include Marion Lorne (Bruno's mother), Kasey Rogers (Guy's wife), and Pat Hitchcock (Anne's sister). These characters help shape and define the principal characters. Pat has one of the best scenes in the movie when she understands that Bruno was strangling her at the party, despite the fact that his hands are around the throat of a silly woman. Thank you for such a thought-provoking essay, Eve. Loved it! What great comments this blog is getting, thanks to every one of you for your great observations and perspectives. The scene of Bruno in the stands at a tennis match staring straight at Guy while everyone else's head is moving is priceless. It has been likened to the scene in "Foreign Correspondent," where all windmills but one are turning in the same direction. I think it was Hitchcock's intention that Guy not be entirely sympathetic. He's handsome and basically decent but fairly weak (it's clear Miriam dominated the marriage). Bruno easily overpowers him and even in the end Guy seems at his mercy. Guy seems to expect Bruno to do the decent thing and confess, even though Bruno has been nothing but irrational and self-serving from the start. Rick mentioned the opening montage, the arrival of cabs, the two sets of shoes and luggage headed for the train...Dimitri Tiomkin's score is very fine and I particularly liked what he did during the opening sequence. Great DIAL H for this month, Eve. 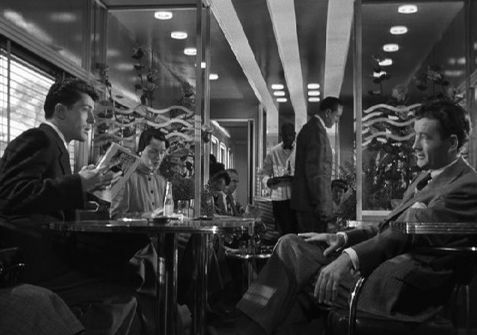 STRANGERS ON A TRAIN is one of my Hitch faves. It has a great story and a great villain. I think Robert Walker is outstanding, but I agree with toto's assessment of Farley Granger's character. The only problem with him is that he doesn't generate much sympathy. I almost find myself siding with Bruno because he's much more interesting and more charming. But, alas, I'm not a Farley fan. He always seemed like a shivering chijuajua to me. It works in ROPE, but not so much in STRANGERS. So many people have mentioned it, but the tennis match sequence is terrific. As Dawn pointed out, it's funny, but I think it's a bit creepy, too! It's a wonderful technique to visualize Bruno's obsession. Vintage Hitch. Looking forward to more DIAL H FOR HITCHCOCK in the months to come! Here's Roger Ebert's take, I think it's insightful: "Granger is softer and more elusive and convincing as he tries to slip out of Bruno's conversational web instead of flatly rejecting him. Walker plays Bruno as flirtatious and seductive...the meeting on the train, which was probably planned by Bruno, plays more like a pickup than a chance encounter...It is this sense of two flawed characters -- one weak, one evil...that makes the movie intriguing...and helps explain how Bruno could come so close to carrying out his plan." By the way, in Highsmith's novel, Guy does kill Bruno's father - just one of the changes Hitchcock in adapting it from book to film.